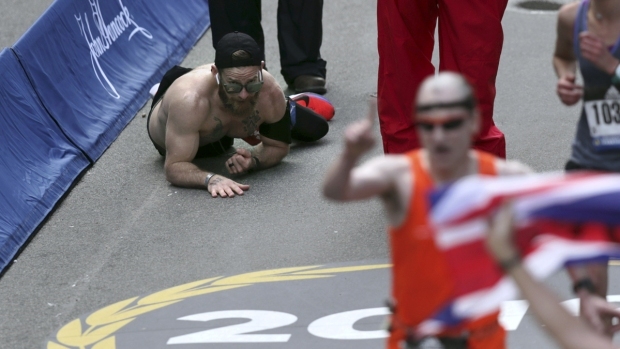 As Marine veteran Micah Herndon dropped to his knees and began crawling in Monday's Boston Marathon, there was no way the pain in his legs was going to stop him from crossing the finish line. Running in the memory of fallen comrades Mark Juarez, Matthew Ballard, and Rupert Hamer, the 31-year-old relied on his military training to finish the race, he said on TODAY Wednesday. "My legs really stopped moving forward, so the next option is to crawl. As Marines, right from the get go, it's instilled, adapt and overcome," Herndon told Savannah Guthrie and Willie Geist. "Whatever adversity, whatever trouble you're (in), adapt and overcome. I low-crawled until the right hamstring loosened up a little bit, so I was able to crawl the rest of the way." Micah Herndon, of Tallmadge, Ohio, crawls to the finish line in the 123rd Boston Marathon on Monday, April 15, 2019. His gutsy performance was a fitting tribute to the memory of his late friends, whose names he wore on small plates fixed to his shoelaces. The three were in the same vehicle when it was destroyed by an improvised explosive device during a mission in Marjah, Afghanistan. Juarez and Hamer, a British journalist, died on impact, while Ballard died later. Herndon was in the same convoy and survived after his vehicle was also hit by an IED blast. Herndon returned home from four years of active duty in Iraq and Afghanistan in 2011 with his own scars. Running has become his therapy for survivor's guilt and post-traumatic stress disorder, which are issues that many veterans are grappling with. "I just hope that what everyone gets out of this whole message, is to bring awareness to PTSD and all the other issues that come from war, and not to be ashamed of it if you're a veteran,'' he said. "I know I'm not. Those are my battle scars, and I'm not afraid of that. "People, they hide a lot of stuff and they say, 'I'm good, I'm good.' That doesn't make you any weaker admitting (it). I'm actually proud of my PTSD. Because that's who I am, and that's what fuels me in my workouts, is looking back at that." Herndon also wanted to use running to bring attention to the situation at Veterans Affairs, where he feels like the system is broken and not providing proper care to military veterans. The Ohio native had never run a full marathon until this year, and his time in his first race qualified him for the Boston Marathon, according to the Record-Courier. He often repeats the names "Juarez, Ballard, Hamer" out loud as he is running. His next goal is to compete in the New York City marathon in November. "The competitor in me, I'm still very upset that I didn't get my goal time, but once I realized that wasn't attainable, I had one goal in mind and that was finish on my own, whatever it may be,'' he said on TODAY.